The New Innovate MTX-L PLUS wideband gauge features Innovate's patented DirectDigital™ technology and all-new Advanced Sensor Control which receives feedback from the sensor more frequently and optimizes heater control. 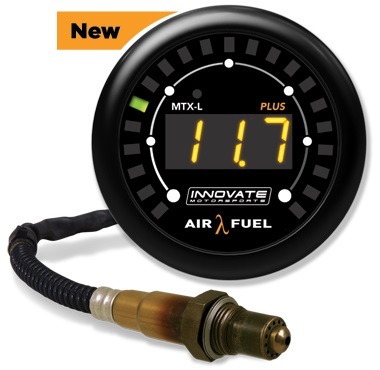 The combination of these technologies makes the MTX-L Plus the fastest, most durable and accurate air/fuel ratio gauge ever! Gauge with interchangeable black and silver bezels, and interchangeable white and black faceplates - use whichever bezel and faceplate you'd like to complement your interior! Bosch LSU 4.9 Wideband O2 sensor - the industry standard for dead-on air / fuel readings. 8ft Sensor cable - perfect length to run from the gauge down to the sensor at the exhaust pipe. 1" exhaust bung - can be welded to your exhaust to add an additional bung if neeeded. Program cable - for use with the LM kit to change programming if needed.